2. Melt 1 tablespoons butter in a small skillet; add mushrooms and sauté until lightly coloured. Add garlic and scallion whites; cook for 3 minutes until tender and remove from heat. 3. Season the fish with salt, pepper and top with lemon slices. 4. Spread out two pieces of parchment paper and brush the paper with remaining butter. 5. Divide all ingredients among 2 different sheets of parchment paper (being careful not to let the stock and olive oil spill) and top with the fish. 6. Wrap up the fish using the parchment paper. Bake for 13 minutes. Remove, unwrap the parchment paper and serve. Tip: this can sit in the fridge for up to four hours until ready to bake. “En papillote (French for “in parchment”), or al cartoccio in Italian, is a method of cooking in which the food is put into a folded pouch or parcel and then baked. The parcel is typically made from folded parchment paper, but other material, such as a paper bag or aluminium foil, may be used. The parcel holds in moisture to steam the food. The pocket is created by overlapping circles of aluminum foil and parchment paper and then folding them tightly around the food to create a seal. A papillote should be opened at the table to allow people to smell the aroma when it opens. The moisture may be from the food itself or from an added moisture source, such as water, wine, or stock. 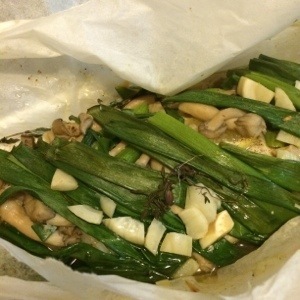 This method is most often used to cook fish or vegetables, but lamb and poultry can also be cooked en papillote. Choice of herbs, seasonings and spices depend on the particular recipe being prepared. Tip 1: DO NOT grate the cheese thinking it will incorporate more rapidly. 1. 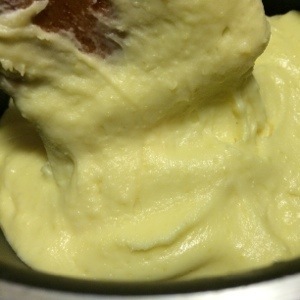 Cook the potatoes in boiling water until quite tender (about 20 to 25 minutes).Peel and mash the potatoes. 2. Place a pot on low heat and place the potatoes in this. Using a wooden spoon, begin gradually and vigorously stirring in the cheese bit by bit. Stir in the creme fraiche, butter and garlic. Tip 2: traditional aligot recipes will tell you to form figure eights while you are doing this, but circle work fine as well. Tip 3: keep the heat low as you are adding the cheese. The goal is to keep things just warm enough so that the cheese melts but you don’t want to be cooking anything here. 3. Continue stirring until the potatoes come away from the sides of the pan and you get long smooth ribbons when you lift the spoon through the potatoes. The whole process of incorporating the cheese will take about 10 to 15 minutes. “Aligot is a dish made from melted cheese blended into mashed potatoes (often with some garlic) that is made in L’Aubrac region in southern Massif Central of France. This fondue-like dish from the Aveyron department is a common sight in Auvergne restaurants. Traditionally made with the Tomme de Laguiole or Tomme d’Auvergne cheese, aligot is a French country speciality highly appreciated in the local gastronomy with Toulouse sausages or roast pork. Other cheeses are used in place of Tomme, including mozzarella and cantal. The Laguiole cheese imparts a nutty flavour. Aligot is made from mashed potatoes blended with butter, cream, crushed garlic, and the melted cheese. The dish is ready when it develops a smooth, elastic texture.